I assume he will note the natural gas infrastructure can't handle providing more supply in winter in a number of jurisdictions. Ontario is one of those jurisdictions. I had a concern with this during the past winter - and then I had a larger concern the system operator was blissfully unaware of the issue. Ontario has shut its coal plants; for all the bad of coal, one big good was that fuel inventory was on site. This may be true of bunker oil at Lennox, but that's really not an improvement over coal at Lambton. 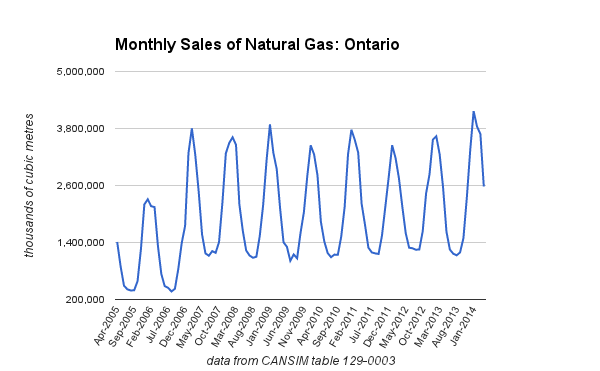 If Ontario is to heat buildings and water while using natural gas to generate electricity too, it's not clear Ontario has the storage capacity to sustain those tasks during cold winters. As for renewables, the expectations can always be too optimistic, at any time of year. Each day the peak was from 6-7pm, when solar production must surely have been 0. Ontario currently has approximately 4000MW of wind and solar capacity.